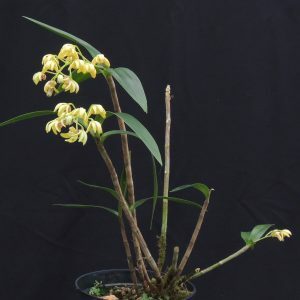 This delicate Australian dendrobium is new to 365 days of orchids and is sometimes forgotten alongside the much larger growing species that flower a little later in the year such as Dendrobium speciosum and Dendrobium x delicatum but its nodding creamy yellow flowers with red spotted reverses are very charming. 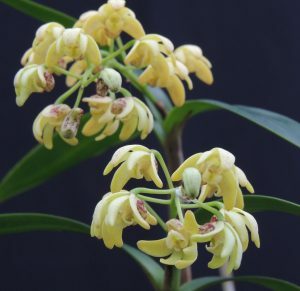 This species is a reported as native to Queensland and New South Wales Australia as well as New Caledonia where it grows as an epiphtye on trees or lithophyte on rocks from sea level up to 600m altitude. Like many of the Australian dendrobiums this species flowers from new and older pseudobulbs simultaneously and so when mature produces a fantastic show of flowers. We grow our plant in our Cool Asia section although its native range indicates it would be happier a little warmer. We grow plants in open bark and water well in the summer but keep them much dryer in the winter.